When a racer has a goal to run at the front of a given race class and always compete for the winner’s circle, it often helps to look at the racers currently achieving excellence at that level to see what types of combinations are in use. The desire to compete in the class that is considered the pinnacle of the small-tire racing world—Radial Vs. 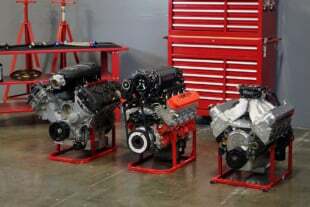 The World—with the BlownZ06 Corvette project campaigned by our sister site, Dragzine, led us to look at Pro Line Racing‘s Hemi engine combination. The all-new, trendsetting car has been under construction at PMR Race Cars over the last year, and will be appearing at the popular Radial vs. 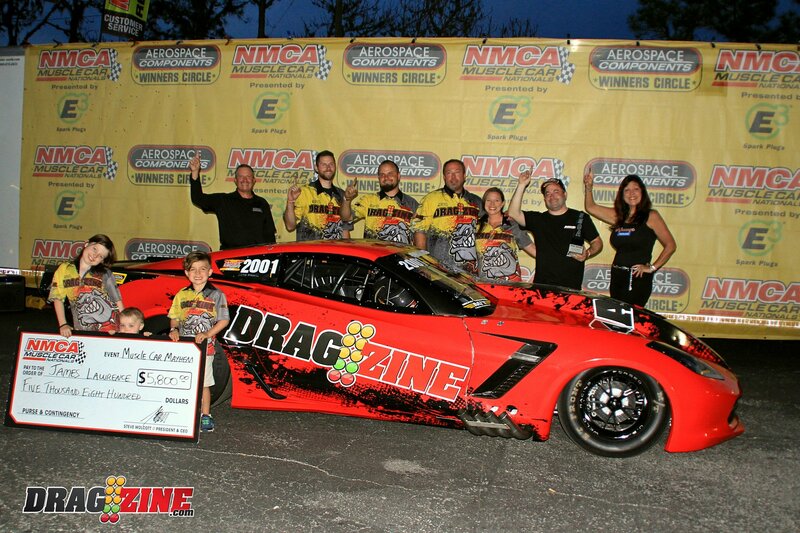 The World and NMCA Radial Wars events all over the country in 2018 and beyond. The chassis, designed with zero compromises, requires an engine configuration which has also been selected from the outset to excel in the given racing conditions it will see during eighth-mile dragstrip duty—and is expected to dip into the 3.70-second range. Due to the magic of magazine deadlines, the car is already out on the track and kicking in the teeth of the competition. In its first outing, driver James Lawrence took the car to a 3.97 in the eighth-mile at the US Nationals. In its second outing at the NMCA’s season opener, he won right here against perennial contender Marty Stinnett in the final round. In the process, BlownZ06’s 3.86 blast during testing made the car the quickest centrifugal-supercharged drag radial car in the world. Not bad for a total of two races under its belt! A meeting with Pro Line’s Eric Dillard and Chris Jones set us on the right path with respect to the engine, which offers a number of advantages to the racer in terms of performance, durability, and ease of service. The engine, which will feature a ProCharger F-3R-136 or F-3X-143 supercharger depending on the event, is based on a lightweight TFX Hemi engine block from Alan Johnson Performance Engineering. Yes, this is the same Hemi block configuration you’d find in an 11,000-horsepower Top Fuel or Funny Car, set up for centrifugal supercharger use here. Billet is beautiful, but more importantly, it’s incredibly strong for this application. Our application uses the Alan Johnson Performance Engineering Light Alky billet block, which is based on the TFX Top Fuel design but is lighter and has a few different features. The Hemi engine needs no introduction as it has been the standard in Top Fuel and Funny Car since, well, forever. Although in a class like RvW, turbocharged engine combinations are often considered the way to go—as they can make upwards of 5,000 horsepower with a pair of 102mm snails—Jones stresses that this is not always the case. Racing is about getting to the stripe quickest and most consistently, not turning big numbers on a dyno in a controlled environment. “The thing that you have to understand when you’re dealing with the large turbo engines in particular, is that you get into major power management issues. Tuning the turbo engine is a hell of a lot trickier in a comparable car due to the massive amount of power on tap and volatility that comes with it. A small error can lead to anything from smoking the tires, to bending rods, or pushing head gaskets. The window can be pretty small to get it right. If you take the supercharged combination and put it into the same car lightened up in accordance with the power change, it’s more feasible to run consistently.” he says. The meticulous nature of the Pro Line engine building team is one of the reasons we chose to use the company for this build. Their talents are undeniable. The internally-balanced Bryant Racing crankshaft is REM-finished to reduce friction along with assisting in its oil-shedding capabilities. 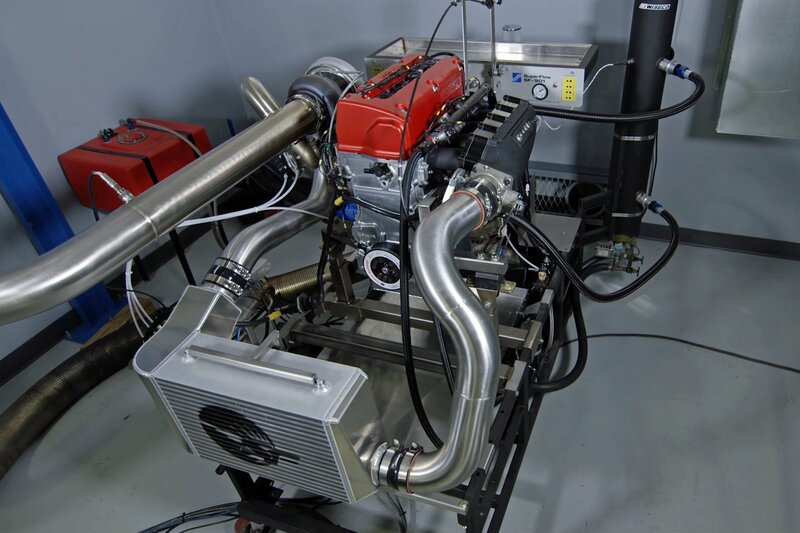 As Dragzine’s original championship-winning BlownZ project Camaro relied upon one of ProCharger’s F-3-121 superchargers, we elected to continue our partnership with the company on BlownZ06, to show off the capabilities of its superchargers in front of the Hemi engine platform. The Alan Johnson Performance Engineering Hemi engine block is one of the staples of the Pro Line Racing engine catalog. Pro Line has had so much success with this engine design all over the world, in such a wide range of drag racing vehicles and configurations, that they turn to it in nearly all instances where the design is permitted for competition. The BME slugs in this engine provide more than 11.0:1 compression, but more importantly, come with the same durability offered to the company’s Top Fuel customers. With the use of the somewhat-standardized Hemi engine program, it allows the company to really specialize in providing the right products for its customers. For example, if a customer needs a set of pistons due to a tuning error or other mishap, chances are they can call Pro Line and those pistons are on the shelf, rather than the customer waiting to have new ones manufactured and being out of commission in the process. The theme at Pro Line is to overbuild the engine as a way to ensure the components are up to the challenge of handling the horsepower desired by the consumer—thus the choice to focus on the proven Hemi platform, which is operating at less than half the demand it sees in a traditional Top Fuel or Funny Car application. “If we add weight to a component or make a slight dimensional change to add some reliability it has a minimal effect on power in most instances,” says Jones. Strength is the order of the day with respect to the rotating assembly. From the forged aluminum BME connecting rods—complete with radial-serrated caps for superior locating abilities—to the Trend Performance TP-1 DLC-coated wristpins, every component has been selected to provide maximum strength and durability. In our particular engine, a variety of factors come into play when using the Hemi with a supercharger rather than the traditional twin-snail arrangement. Although Jones won’t divulge exact details, piston design is altered with a larger dome to raise compression ratio—north of 11.0:1—as the supercharger produces less heat in the cylinder than a twin-turbo engine. Camshaft design is manipulated, and other factors are adjusted as well during the design and build process to fit the specific project goals. We’ll cover camshaft design in the second article segment with the rest of the induction components. “The blown engines will have a bit more compression along with a larger cam. The larger blower cam bleeds off cylinder pressure, so the increase in static compression with a larger dome is offset dynamically to a degree,” says Jones. 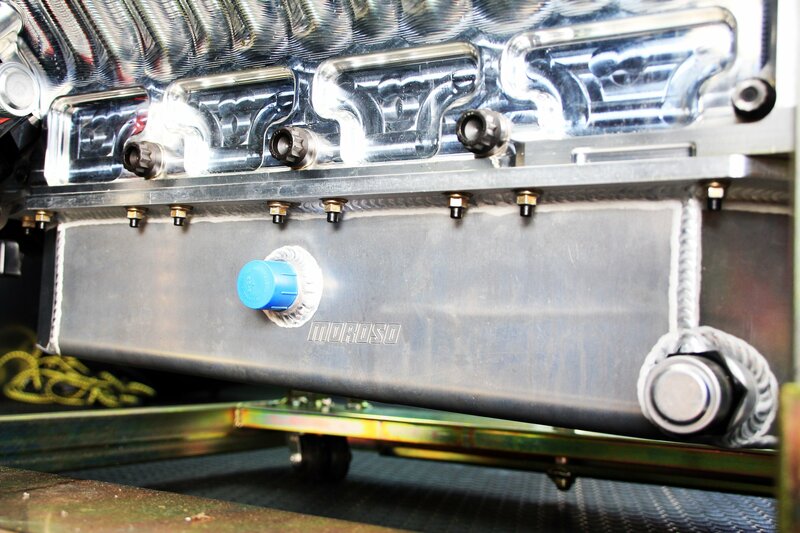 The oiling system sticks with pieces that are familiar to—and on the shelf at—PLR, in the form of a Moroso oil pan, System 1 pump and filter, and Peterson Fluid Systems’ primer/filter mount system to assist us in bringing the oil pressure up to snuff before it’s time to go out and make a pass. The bottom end is kept in check by Clevite’s coated rod and main bearings derived from the Vandervell design, which have proven themselves in thousands of high-performance race engines of all types, all over the world. The System 1 external wet sump oil pump assembly is quite trick; it offers adjustability from 125 to 250 psi oil pressure and a blueprinted spur gear design for consistency and durability. We also have one of System 1’s HP-6 style oil filters, which features a modular design and 75-micron stainless steel cleanable filtration element. Other important pieces came in the form of RCD Engineering’s aluminum gear drive system for the camshaft—there is no belt cam drive here. RCD’s system eliminates any possibility of camshaft timing varying under load, which is critical when you are trying to make a literal ton-and-a-half of horsepower from 548 cubic inches of displacement. The company also sent over its crank trigger system, which features a magnet-equipped ring to work with the MSD sensor we’ll be using. Without many parts like the crank trigger bracketry, titanium crank hub, flat degree ring, Burn Down breather tubes, and other assorted equipment—which all come from RCD and are spec’d for this engine platform—this engine would not have become reality. We also needed other assorted fasteners from RCD like the crankshaft damper bolt kit and other parts required to finish up the short-block. As we’re not using a magneto in our application, we picked up one of RCD’s Mag Eliminators to plug the hole and get us set up to use FTSPARK coil packs with our FuelTech FT600 engine management system—which you can read about here. If you could say an engine expected to make upwards of 3,000 horsepower is simple, then our AJPE-based engine is simple. Expensive? Yes, of course, because the materials and engineering effort required to harness power of this type isn’t cheap. But it is simple. As the engine configuration has been scienced out already by the Fuel racers (and many other racers within the PLR stables), setting it up to work with the ProCharger is a matter of detailing the small nuances which will help to make the program successful. The aforementioned AJPE TFX billet Hemi engine block [PN 11A-002-L-4467-65-KW] features a 10.225-inch deck height, 4.467-inch bores, and .250-inch raised 65mm cam journal dimensions. These utilize the latest and greatest features in Top Fuel technology with the lightweight forged billet material, and have been used for years at the highest levels of drag racing. With heritage such as this, they’ll serve us well in what—amazingly—is considered less than half the power level they typically can withstand. 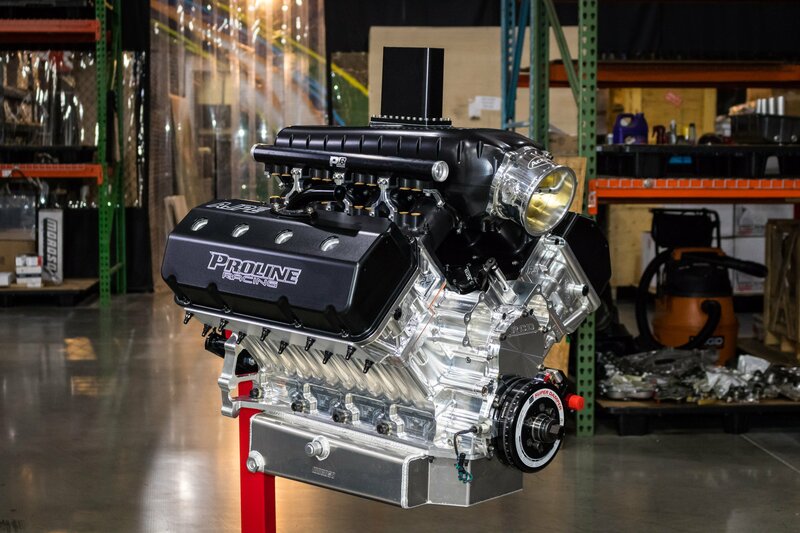 The block arrives at Pro Line completely CNC-machined, with Darton ductile iron sleeves installed, H-11 tool steel main studs and 2.600-inch lifter-bore spacing to fit the AJPE Muscle cylinder heads properly. We’ll talk about those—and the rest of the induction system—in the next article. 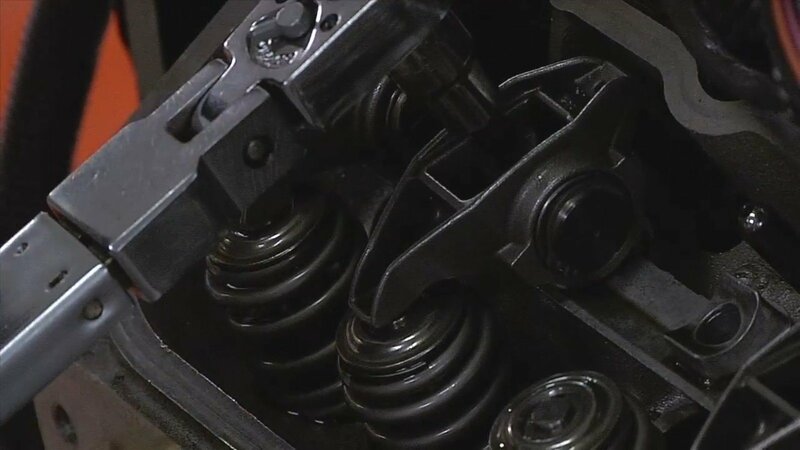 Measuring the crankshaft’s endplay is critical to ensuring that the crankshaft doesn’t bind (too tight) or cause issues like thrust bearing failure, crankshaft damage, or a host of other problems should it be too loose in its home. The NHRA champion heritage at Bryant Racing is evident in the performance of the company’s production of EN30B USA Timken Steel billet crankshafts, one of which has found its way into our Hemi engine. The 4.375-inch stroke, eight-counterweight crankshaft is what you’d call the “cream of the crop” when it comes to the magnificence of the construction of the component. The crankshaft for our engine has undergone REM Isotropic Superfinishing, which imparts a jewel-like appearance to the crank’s surface. This finishing process improves the wear properties of the crankshaft by reducing friction, and as we all know, less friction is always advantageous in a racing engine. The REM process also improves the radius areas of the crankshaft’s journals. Another small detail is checking the rod bolt stretch to ensure torque. Using a connecting rod vise, the length of the rod bolt is checked before and after the torquing process, ensuring that these critical measurements are within specifications. 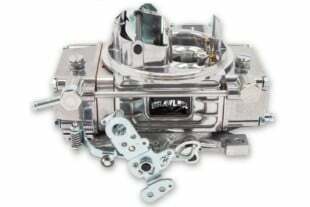 Pro Line Racing has an established working relationship with the fine folks at Bill Miller Engineering, whose products make up the bulk of the rotating assembly. 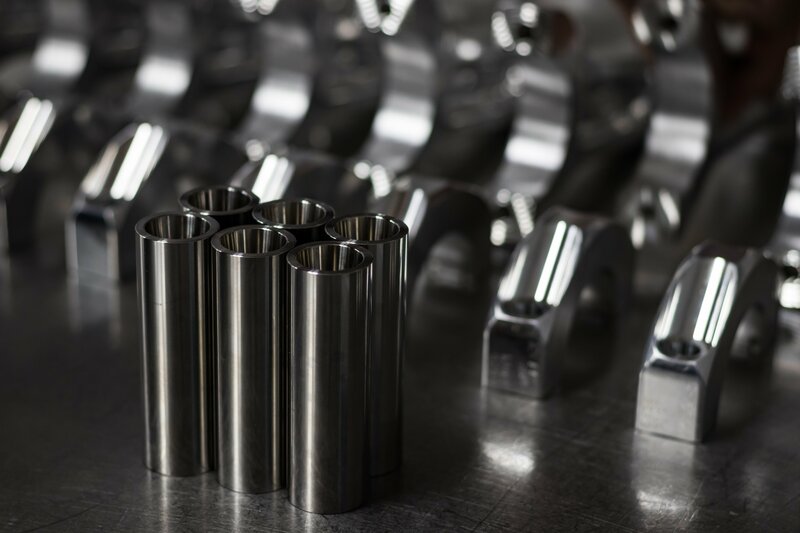 With 25 Funny Car champions using BME’s forged aluminum connecting rods over the last 28 years, it’s clear that the company understands how to manufacture products which can withstand the immense loads seen in an engine of this caliber. The connecting rods are based on BME’s 426 forging and measure 6.625-inches from center of the wristpin bore to center of the big end. The rods are made in the USA with 100-percent American materials, which allows the company to monitor the production process with stringent requirements. 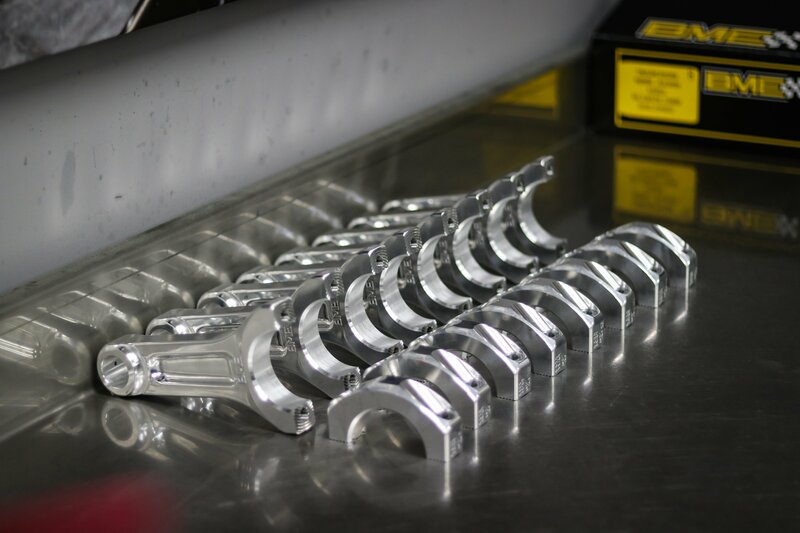 With a continuous focus on how to improve the manufacturing process through its own in-house testing, inspection, and unique processes, BME has developed what is the standard in Fuel-style connecting rods. The rods feature ARP‘s ARP2000 material which uses a BME-specific heat-treating process which has been developed through a collaboration between the companies. Hard-anodized 7050 aluminum main caps use two vertical studs and two horizontal fasteners to provide all the strength needed to build monstrous horsepower from our Hemi. Clevite bearings are used in both main and connecting rod locations. 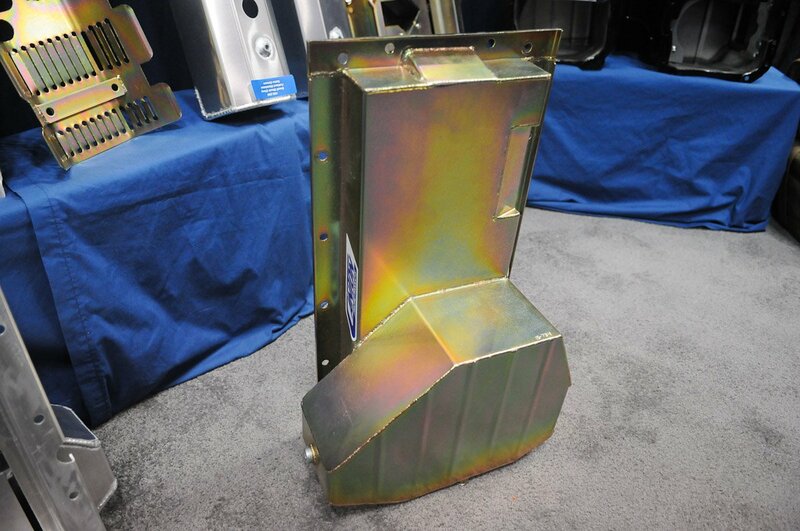 The forged-aluminum, 2618-alloy pistons are also pulled from BME; it only stands to reason that the company’s successes with its connecting rod program in Fuel applications carries over to its piston line. There are several baked-in performance advantages to BME’s pistons, chief among them the near-mirror finish in the piston ring lands, which helps to provide superior heat transfer from the piston to the engine block. Micro welding—which is where the ring gets so hot that it causes microscopic pieces of piston to weld themselves to the ring surface—is caused by a failure of the piston ring to transfer the heat from the piston crown to the cylinder wall and can quickly kill engines; it’s in this area of piston design where BME has concentrated its efforts to create what they feel is a superior finish of the ring groove area. The wet sump oiling system on this engine came about after quite a bit of research by Pro Line in partnership with Moroso Performance Products in Connecticut. The two companies worked together to develop a solution for the issues that the Pro Line-powered cars were seeing, and the end result was this trick (we can't show you the insides) wet-sump oil pan configuration which offers tremendous performance capabilities and reduced complexity in what is one of the area of engine design which can often be overlooked. In conjunction with the System 1 external wet-sump pump, the Moroso pan ensures we will have no concerns with our oiling system. “The major reason for running the wet sump originated with our Pro Extreme program a few years ago. Those cars needed to be as light as they could be. By removing the dry sump tank and lines along with the extra oil, it took 37 pounds out of the nose of the car. There is a cost benefit of about $1,000 less when going to a wet sump from dry sump as well, but that really wasn’t a motivating factor. 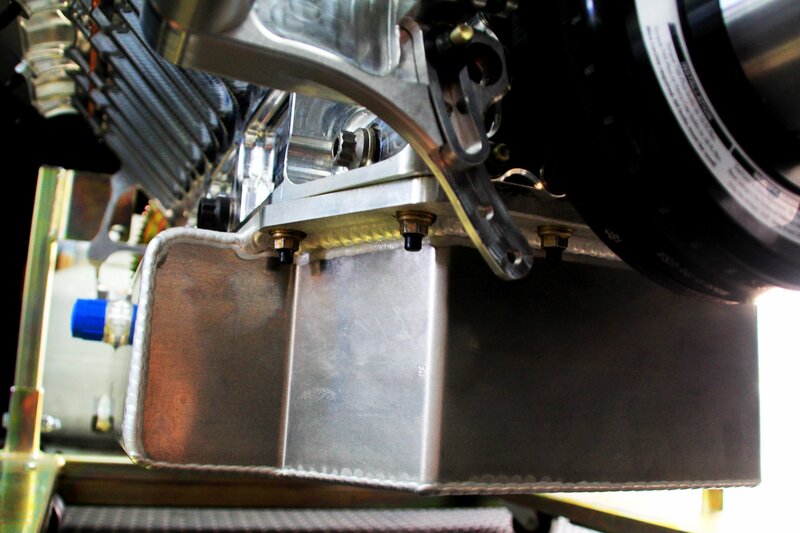 The pan design with the kick-out and windage tray allows us to run the wet sump with no major issues. During the infancy of the Hemi program we ran into lots of trouble with oil pressure fluctuations and falling off at the top end of the track. This was especially true in the quarter-mile cars. The sump depths are crucial to maintaining good pressure throughout the run. Our current pan actually uses less oil to stabilize pressure than our old shallow pan needed,” Jones explains. To keep the bores sealed up, a set of Total Seal’s custom piston rings designed for this application are onboard. As this application is fully custom, Pro Line didn’t want us revealing any of the technology nor specifications for the rings—and we can’t blame them. 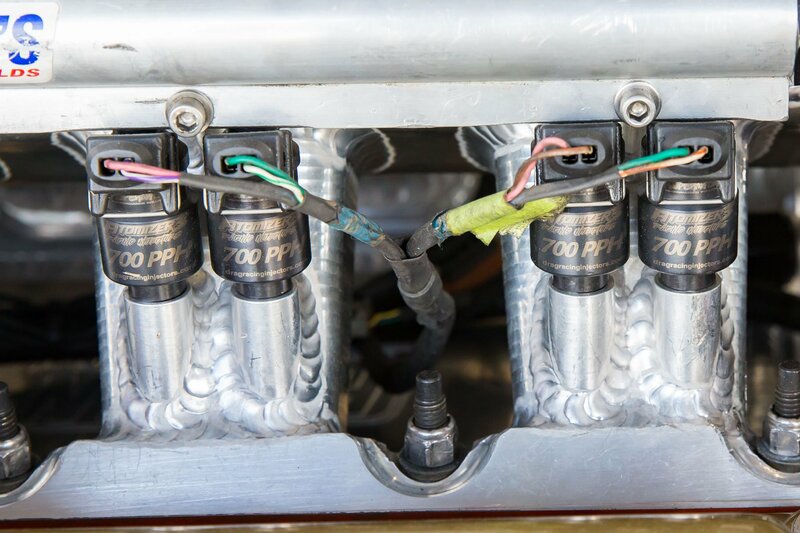 When you spend boatloads of dollars developing engine combinations to perform at the front of the pack, you don’t want anyone divulging your secrets. ATI’s Super Damper is designed to harness engine vibrations, and will be pressed into severe duty in this application, as there will be plenty of harmonics to dampen from the 3,000-plus horsepower running through the crankshaft. Trend Performance set us up with a set of its TP-1 wristpins, which are constructed from tool steel and were initially developed for Top Fuel applications. One interesting—and lesser-known—fact is that piston pins spin, especially during valve overlap, and if the pin stalls in the pin bore, it will wreck the rod and piston in the process. The exceptional concentricity built into the TP-1 pins prevents this from occurring, as holding the manufacturing process to extremely close tolerances is imperative to ensuring the pin’s ability to spin. The TP-1 pins uses Trend’s DLC coating to further improve durability. The finished short-block, minus oil pan. Stay tuned for the next installment, which will detail the top-end and induction components, coming soon! This is far from the end for this project; in fact, we’re just getting started. Stay tuned for the next installment of the engine build series where we discuss the induction components and finish off the long-block, before we get into the final installment which will include our dyno testing of this insane piece of machinery. Keep your eyes peeled right here for more! 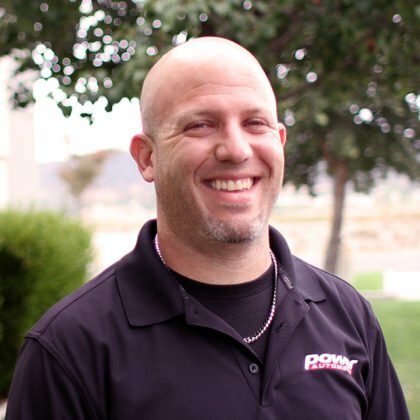 Jason draws on over 15 years of experience in the automotive publishing industry, and collaborates with many of the industry's movers and shakers to create compelling technical articles and high-quality race coverage.